Nick Matthew makes his point during his second round win over Leon Au in Cairo. Picture courtesy of PSA. Matthew’s 11-7, 11-7, 11-8 triumph was the one highlight for the White Rose on a day which brought an end to the hopes of Pontefract’s James Willstrop and Harrogate’s Chris Simpson. 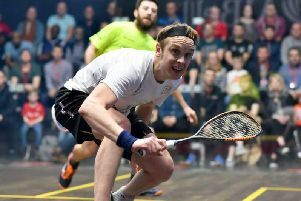 World No 5 Matthew from Sheffield will now enjoy a rest day before taking on Germany’s Simon Rosner on Sunday for a place in the last eight at the Wadi Degla Club in Cairo. “I was happy, especially after yesterday, to get a 3-0 win today,” said 29-year-old fourth seed Matthew, who was pushed to four games by New Zealand’s Campbell Grayson in round one. “I was telling myself to stay fresh but sometimes you can rush it, so that was the danger. Sometimes you have to put the hard yards in to win quicker. “Last time (against Rösner) it was a big match for me at the US Open, we played in the second round after I came off a defeat in San Francisco (at the NetSuite Open) in the first round there. “I played the wildcard, Chris Gordon, in the first round of the US Open, so I wasn’t really tested at that level and then I was 2-1 down to Simon. If I had lost that match it would have been a tough season for me, but I battled through that match and went from strength to strength. Former world No 1 Willstrop has shown impressive form of late since returning from an injury layoff but couldn’t find a way to get past Egypt’s Ali Farag, who progressed to the third round after more than an hour of scintillating play, the 10th seed eventually prevailing 5-11, 11-1, 11-8, 9-11, 11-5. “I gave it my best, it was a great match, and I cannot ask for much more at my age,” said 33-year-old Willstrop. “I can’t expect more, I had three great tournaments in a row, it was a very fair and competitive match, and he was just better today. Nick Matthew gets in a forehand smash against Leon Au in Cairo. Picture courtesy of PSA. Simpson produced three tough games with 16th seed Max Lee, from Hong Kong, but they all went the way of his opponent to leave him a frustrated figure after the 11-9, 11-6, 11-7 defeat. Elsewhere, world No 1 and top seed Mohamed ElShorbagy saw off the challenge from Finland’s Olli Tuominen, prevailing 11-9, 11-2, 11-8 in just 34 minutes. Matthew’s third round opponent on Sunday, Rosner, booked his place by defeating Mexico’s Cesar Salazar 11-8, 11-7, 12-10. Sometimes you have to put the hard yards in to win quicker. Ali Farag, right, celebrates victory over Yorkshire's James Willstrop, left, in the second round of the world championships in Cairo, Egypt. Picture courtesy of PSA.